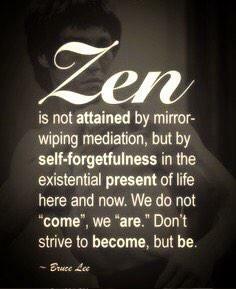 Where does the Zen in ourself exist? How are we able to connect to this place, and then truly experience it? These questions you may have asked yourself before, they are valuable queries indeed. I want to tell you that this place of Zen resides deep within your Soul, this is without a doubt. Each and everyone of us has ‘the Zen’, we were graciously born with it. Most people unfortunately will never find it, for the Zen in them has long since given itself up to their Ego mind. Only a few will have the gift of getting to know and becoming a part of this special place inside of us. The Zen asks very little of us, and perhaps it’s subtle and gentle silence is why we seldom here its calling. It might nudge us now and again, but our senses are deafened by the influence of our Ego, and so we disregard or even worse, we ignore the whispers of the Zen. We do well at making our life busy, constantly doing, continually in motion at a nonstop pace, why do we never want to stand still! Conceivably stillness causes us discomfort, is it an inconvenience that any moment of time allowed to be with only ourself is a troublesome nuisance! Most of us don’t like to just ‘be’, not because we don’t crave it, but because we don’t know what to do when we are there. Just being Zen might feel like being stranded on a deserted island in the middle of an angry ocean, no food or water or anywhere to run to. Zen, it is something we openly tell people we need, or want, ‘if I only had time for myself, I would be happy’! But the truth is those words are only from our Ego looking for sympathy or attention. If you really want to be one with the Zen you must first be comfortable with the Now. Because you see, the Zen and the Now are a team, they are siamese twins, inseparable, without one you have no other. If you truly desire to be in the Zen, you have no choice but to be with the Now. A single moment of silence, if you master this then that sole very brief period of time divides into minutes, and then into hours, days, months and so on. Everything becomes the Now, because in reality that is all we have.